His Eyes Are on the Lilacs, And I Know He Cares For Me! We left the arid, drought drenched plains of the Texas panhandle at the beginning of 2013 and moved to the majestic mountains of New Mexico. It was nothing short of a complete leap of faith. There was not a job bringing us here. There was very little family here to support us. It was a dream of J-Dub’s to live here and so we shut our eyes and leapt knowing that “the Lord thy God is with thee whithersoever thou goest”. Amen? Whithersoever. Doesn’t the old KJV just say it good sometimes? Beauty surrounds us here. Snow capped mountain tops, fields of flowers, tall pines, rolling streams, abundant wild life. 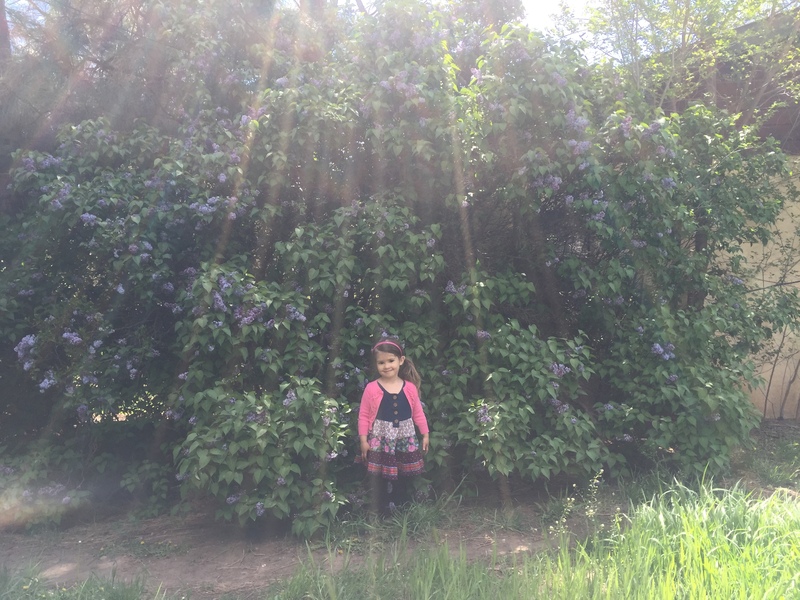 That first spring of 2013 arrived and I was awed by the sight of the lilac bushes that surrounded our property. And I do mean surrounded. They are monstrous bushes, standing well over 10 feet tall and lined up in a row, bumping into each other. I was so anticipating the arrival of all these purple bursts of flowers, that I blogged about it here. Yet, I was left disappointed when a late freeze blasted the buds. The next spring, once again, those tiny purple buds appeared and I held my breath only to be disappointed once again when Old Man Winter blew his icy breath on them. Earlier this year, JDub and I made a very difficult decision that it would be the best fit for our family if we returned home. Yes, to that arid drought drenched Texas Panhandle. We must wait until school is finished, so this will be our last Spring time here. Of course, I started a list of things I would miss about this place. Of course on that list is all the things that make is so beautiful. Right before Easter, the many lilac bushes once again showed their promise, but I didn’t hold my breath. We drove back to Texas for the Easter break and my last thoughts as we pulled out of the driveway and I gazed upon the massive bushes were, “oh well. If they do bloom, they’ll be spent by the time we return.” No faith. No faith at all on my part. Sometimes prior disappointments squash it, don’t they? We don’t want to be disappointed again. In people. In circumstances. Instead we prepare ourselves for it not to happen instead of looking toward it. Where is our hope? We replace our hope with “realism”. But lo and behold, when we pulled back in several days later, I was met with an awesome welcoming! Those purple (and one bush of white) lilacs were in bloom and greeting me. They were happy, I could tell it. Every blossom oozed happiness. I was overjoyed! I began laughing and whooping and clapping before I ever got out of the car. The past several weeks the bushes have bloomed and bloomed. Their aromas have washed over me filling me with memories and pleasure. We have brought some inside and placed them in Mason jars. Now, I’m sad to say they are at the end of their blooming season. But I’m so glad I got to experience them, this last spring I have to live here. It’s God you know. Of course it is. He has a way of caring about what we care about, even little things like lilacs, which I dare to argue aren’t little things. He GAVE the ultimate gift. Our God is a gracious giver. He will give us what we need. Phillipians 4:19 And my God will supply every need of yours according to His riches in Christ Jesus. 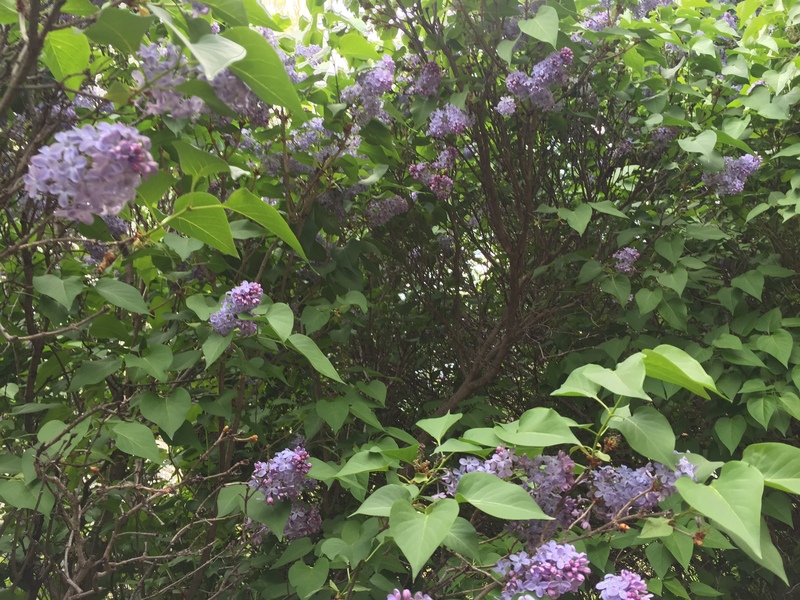 Why do we worry about our needs when we can call upon the God of the World, the Creator of all, the one who tells the lilacs when and where to bloom to help us? Is there something you are consumed with? Are you worrying about a detail of this life? Read again Matthew 25-32 and be reassured. “That is why I tell you not to worry about everyday life—whether you have enough food and drink, or enough clothes to wear. Isn’t life more than food, and your body more than clothing? Look at the birds. They don’t plant or harvest or store food in barns, for your heavenly Father feeds them. And aren’t you far more valuable to him than they are? Can all your worries add a single moment to your life? “So don’t worry about these things, saying, ‘What will we eat? What will we drink? What will we wear?’ These things dominate the thoughts of unbelievers, but your heavenly Father already knows all your needs. Friends, I am preaching to myself! Since deciding to move back to our hometown, J-Dub and I have experienced quite a few roadblocks. We have worried. We have fretted. We have doubted. I have wondered if God is going to come through. But I can tell you, when I think about my past and I think about the things He has done, and I read the promises from His word, I can affirmatively answer that Yes, he will come through. He has yet to let me down. It’s the original work of Satan, to lie to us and to make us doubt God’s word. Recognize it as such. When Adam and Eve were in the garden, wasn’t that the words of the Serpent? He began with “Did God really say………” He planted enough doubt in Eve’s heart that she sinned. Yet we are told that the promises of God are Yes and Amen. We are told that those who believe in Him will not be made ashamed. Look and see that the Lord is good. He will come through for you. He will come through for me. So open your arms and receive my friends. Beautiful again. You have such beautiful words. Love you! Thank you bert. Love you too! This is such a beautiful reminder! I’m so excited to continue to see your story unfold! Thank you Kaylie! Me too.